The Royal Princess of Princess Cruises was launched in June 2013, and the new ship had a Princess for a Godmother--Her Royal Highness The Duchess of Cambridge, or Princess Kate, as she is lovingly called by her many fans. The Royal Princess is a big one -- 141,000 tons, 1,083 feet long, 217 feet high, 155 feet wide, and carries 3,560 passengers. I sailed on the Royal Princess in the summer of 2014 on a memorable voyage to the Baltic and northern Europe. The Royal Princess is a sister ship to the Regal Princess. 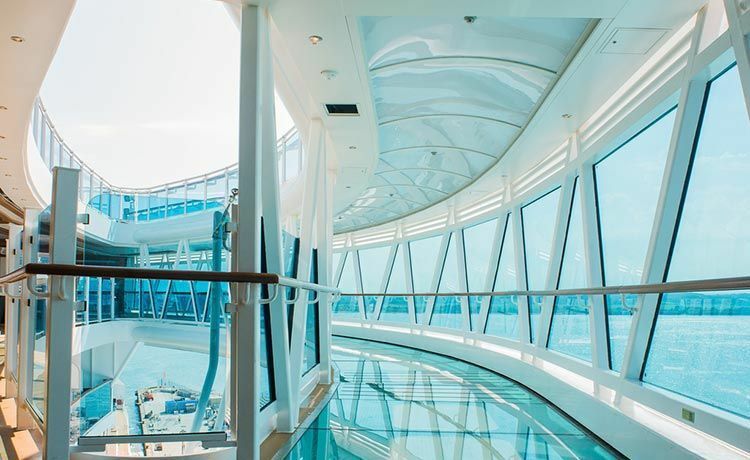 The SeaWalk – This glass-bottomed enclosed walkway on the ship's starboard side of the top deck extends more than 28 feet beyond the edge of the vessel. Those who have the courage to peek can see 128 feet down to the sea's surface. Atrium – The Atrium is the social hub of the ship, with a collection of quick bites and light meals, beverages, entertainment, shopping, and guest services. New features in this Princess atrium include Bellini's Italian cocktail bar, Ocean Terrace seafood bar, and a gelateria. The Atrium on the Ruby Princess was a great place to hang out, and I'm sure the Royal Princess venue has a similar ambiance. Chef's Table Lumiere – This experience has changed a little since the Chef's Table evening I enjoyed on the Emerald Princess. The new name is the Chef's Table Lumiere, and passengers are surrounded by a curtain of light that provides a soft wall of privacy. Water and Music Shows – The ship's central pool area features daily and nightly performances of dancing fountains, special music and live performers. Princess Live! – The ship's 300-seat television studio features a variety of live programs. Horizon Court Buffet – This casual dining option is redefined with action stations that offer Asian cuisine, Mediterranean dishes, a pasta corner, and salad-tossing stations. Diners can also indulge in new specialty experiences at the Crab Shack and Fondues. Horizon Bistro Pastry Shop – This dedicated pastry shop serves fresh-baked goodies throughout the day. Private Cabanas – Passengers can book these elegant spaces in The Sanctuary or at the Retreat Pool. To enhance the experience, guests can order one of the ship's new cabana picnic baskets, packed with artisan edibles paired with a premium wine. All cabin and suite categories except the deluxe balcony cabins have some that are wheelchair accessible. Fifty of the staterooms on the Royal Princess are adjoining. Royal Princess' cabins and suites offer a number of updated features and changes included due to passengers suggestions from earlier ships like the Ruby Princess and Emerald Princess. Among the changes are larger showers with hand-held shower heads, pillow top mattresses, upholstered headboards, and bigger television screens with on-demand programming. In the years since the Ruby Princess was launched, cruise travelers have begun traveling with more electrical items. Princess has spaced electrical outlets further apart on the Royal Princess to facilitate charging multiple items and now have one 220-volt socket. Additionally, several energy-saving features have been built into the staterooms, including a card reader that activates the room's lighting, plus low-energy LED lighting fixtures. The deluxe balcony, a new cabin category, has an additional sofa bed and some of the upgraded amenities found in a mini-suite stateroom, including enhanced bathroom amenities, waffle bathrobe, and an upgraded duvet. In addition to the new general cabin amenities, mini-suites now offer a decorative central lighting fixture, a privacy curtain between the bed and sitting area, and marble-topped counters. Suites feature larger televisions, two sinks in the bathroom, accent lighting and a glass-paneled shower. The Royal Princess is the first Princess ship to have a dedicated concierge lounge, an exclusive area with access to full front desk services, plus light snacks and beverages. Here, suite passengers have dedicated staff to assist with such things as shore excursions, specialty dining or Lotus Spa reservations. It is also used as a private disembarkation lounge for suite passengers. Royal Princess features three main dining rooms, Allegro (which also houses the Chef's Table Lumiere), Symphony and Concerto (both of which feature tables surrounded by wine cellars). Crown Grill & Wheelhouse Bar – The Crown Grill premium seafood and chop house has been blended together with the Wheelhouse Bar with a menu of chops, seafood, and premium Sterling Silver steaks. The location also features a free daily pub lunch. Sabatini's – Princess' signature Tuscan-inspired specialty restaurant, Sabatini's features a fresh menu of Italian favorites with an a la carte experience. The Royal Princess has multiple casual dining venues, each with different cuisine and personality. Alfredo's –Serving up fresh, hand-tossed Neapolitan-style pizzas hot out of the oven, Alfredo's complimentary pizzeria menu has been expanded to include a variety of Italian antipasti, soup and salads, a hearty calzone and pizza baguette, and delicious baked pasta in addition to desserts. With 121 seats, Alfredo's is the largest pizza restaurant at sea and features an open kitchen where passengers can watch chefs craft their pizza. Vines – Vines wine and tapas bar serves a selection of exclusive new- and old-world vintage wines along with wine sampling, food pairing, and unique events. Tea Tower – Featuring a tea sommelier and a choice of 250 blends, this unique tea tower is located in the ship's central Piazza. Pub Lunch – The complimentary pub lunch is served daily across the combined space in the Wheelhouse Bar and the Crown Grill. Previously available only on select sea days, Royal Princess offers the full traditional pub-style lunch on all sea days – and on the port, days serves fish and chips and a plowman's lunch – along with signature brews. Gelato –A gelateria and creperie, Gelato offer Italian-style ice cream creations. Princess Live! Café – Adjacent to Royal Princess' television studio, the café serves up barista-style coffee and tea selections, accompanied by daily changing quick-bite food selections. After 5 pm, the bar offers up a menu of aperitifs and digestifs. Trident Grill –In addition to the hot dogs, hamburgers and chicken sandwiches, aboard Royal Princess this poolside spot transform into a traditional smokehouse-style barbecue each evening. Outrigger Bar – This top-deck bar includes a Margarita Bar starting at lunchtime, accompanied by Tex-Mexican dishes to keep the fiesta going into the night. The drink menu includes 12 specialty margaritas, Sunsational Slushies, and a morning Bloody Mary bar. Prego Pizzeria – A perennial Princess passenger favorite, Prego serves up freshly made Italian-style pizza by the slice, featuring classic flavors and a daily special. Swirls – Passengers can enjoy a refreshing soft-serve cone complete with dipping sauces and sprinkles or splurge on other ice cream treats. Cabana Picnic – At the new adults-only Retreat pool and bar, passengers can indulge in a gourmet picnic. A variety of picnic basket options are available along with champagne packages. The Horizon Court Buffet has been redefined with a completely new layout and doubled in size. New action stations provide additional dining options, including choices such as Asian cuisine, Mediterranean dishes, a pasta corner, and salad-tossing stations. For early risers on the go, new "Grab & Go" options are available, as are healthy breakfast options. Those who love to sleep in even have a special "late, late risers" breakfast corner. At lunch, a variety of new live stations feature a regional flair, including a rotisserie and Japanese Hibachi Grill. In the evening, the Horizon Court becomes the Horizon Bistro, an interactive experience with themed events and specialty dinners. On certain nights passengers may find a Brazilian churrascaria, Argentine gaucho theme, German Beer Fest, a European bistro or British pub. Actions stations found here include a hibachi grill, rotisseries and carving stations, a taqueria, and a sandwich bar. Two fun specialty dining choices (with an extra surcharge) are housed within the Horizon Court – a Crab Shack and Fondues. Crab Shack – Seafood lovers have a full crab shack experience, complete with mallets, bibs, and buckets. Diners can enjoy crawfish in a Bayou-style "Mud Bug" boil, spiced peel and eat shrimp, or a mixed steamer pot filled with snow crab, jumbo shrimp, clams, and mussels. Fondues – A variety of cheese fondues highlight this special experience, including classic Swiss with white wine, German cheddar fondue with beer, and a French cheese fondue with champagne. Other Swiss, German or Austrian specialties round out the menu. The Horizon Court introduces the Horizon Bistro Pastry Shop. Here passengers can indulge in croissants, pastries, hot desserts, freshly baked waffles and French toast at breakfast; classic and modern desserts at lunch and dinner; tea sandwiches, cookies, desserts and waffles at tea time; and special show pieces and flambés in the evening. The Horizon Court has a special area just for kids, where they have seating that is suited to them in size and décor. Here kids can eat, play, and sit in their dedicated section with the rest of their family still nearby. Space is also used by the Youth Center for activities such as pizza parties and ice cream socials. SeaView Bar – Opposite the ship's signature SeaWalk, the SeaView bar also extends over the waves for dramatic views. Bellini's –This brand new Italian-inspired cocktail venue is a perfect place to enjoy the lively atmosphere of the Atrium's activities while indulging in Bellini-inspired cocktails. Crooners – Princess' 1960s-style martini bar offers a menu of more than 75 unique martinis, shaken tableside. Club 6 – While passengers dance the night away in the ship's ultra-lounge nightclub, they can also choose from an illuminated menu of fun specialty cocktails and premium spirits. Whiskey Flights at Wheelhouse Bar – Wheelhouse Bar features a menu of three different whiskey flights – each featuring three whiskeys. Passengers can choose from single malts, three "Glens," and other iconic whiskey options. Royal Princess passengers find a range of options to keep them entertained--clubs, theaters, casino, and shows. Princess Live! – The new television studio aboard Royal Princess features programming throughout the day from 8 am until midnight. Passengers can enjoy live talk shows, demonstrations, and performers here, including the daily Wake Show. With seating for just under 300, the space gives passengers an opportunity to meet the ship's entertainers, play games and enjoy refreshments with the dedicated café. Princess Theater – The line's largest Princess Theater ever, with unobstructed sight lines from every seat, the Princess Theater offers high-definition screens and a brand new lighting system to enhance each show. Vista Lounge – An all-new Vista Lounge at the aft of the ship serves as an alternate evening performance venue, offering a more intimate entertainment setting. Casino – The Princess Casino aboard Royal Princess features the latest slots and table games. Passengers can indulge in their favorite games of chance, and a spiral staircase in the casino leads up to Deck 7 and the onboard boutiques. Water & Light Show – New water and light shows bring excitement to the top deck pools with fountains that shoot plumes of water to delight and amaze all members of the family. Daily and nightly performances of four separate themed sequences comprise dancing fountains, special music and live performers. Movies Under the Stars – Not only is the Movies Under the Stars screen 30 percent larger than on other Princess ships, but it is also currently the largest such screen at sea – measuring 34 feet wide by 20 feet high. Princess' signature poolside theater has a variety of movies and concert playing on the big screen, offering passengers a great view while they relax on a comfortable lounger snuggled under a cozy fleece blanket and snack on complimentary fresh-popped popcorn or delicious cookies and milk. The expanded Lotus Spa on the Royal Princess is located just off the atrium, and those who love Princess' adults-only Sanctuary and pool appreciate the fresh look these areas now have. In addition, the larger Sanctuary has private cabanas for rent, and users can even enjoy a gourmet picnic. The Lotus Spa has more treatment rooms than any other Princess spa. New features include private Couples Villas and The Enclave – a thermal suite that is triple the size of any existing Lotus Spa. Here passengers can totally decompress with new relaxing options such as the Hammam (a Turkish-style steam room), the Caldarium (an herbal steam room), the Laconium (a dry heat sauna) and the line's first-ever hydro-therapy pool. The Royal Princess' fitness facilities include a new outdoor jogging track and additional circuit exercises, the multi-activity Princess Sports Central, and a fitness center full of the latest equipment with a private aerobics studio for special classes. Princess Pelicans (ages 3-7): The youngest age group enjoy a great space for group activities like movie nights, a new mini air hockey table, a special area for arts and crafts programs, and a new indoor play structure. In addition, they have an outdoor play area, which includes toys, games, tricycles, and a new playground. These features add to the lineup of popular activities that kids love on Princess ships, including the Jr. Chef@Sea program, educational workshops, pajama and ice cream parties, and a Kid's Fun Fair. Shockwaves (ages 8-12): Junior passengers in the middle group have their own dedicated outside area complete with lounge chairs and a variety of fun games. Shockwaves kids get into activities geared for their age – like air hockey, skeeball, and exciting game stations. They also find their own lounge with a giant TV, a DJ Booth, and arts and crafts tables with activities led by Princess' youth counselors. Plus they can hang out and enjoy their own pizza and ice cream parties or kids-only dinners. Remix (ages 13-17): The Remix area for teens features a Princess DJ booth loaded with cutting-edge tracks where music lovers can create their own playlist, kick back, relax, or dance to the latest club mix. In addition, there's a lounge area, perfect for meeting new friends, with games like foosball, skeeball and the latest video games. A brand new outdoor lounge fulfills a request from teens and offers cool club lighting, contemporary seating, a great new wading pool, and of course music perfect for parties under the stars. Teens also enjoy activities specially designed for their age group, including sports competitions, late-night movies, hip hop dance classes, teens-only "mocktail" parties, formal dinners, and the always-popular video game tournaments. What Is the Princess Cruise Line Regal Ship Like?